Yossi Milo Gallery is pleased to announce an exhibition of color photographs by Chris Jordan. The exhibition will open on September 8, and close on October 15, with a reception for the artist on Thursday, September 8, from 6:00 to 8:00 pm. This is Jordan's first solo show in New York. Jordan's large-scale color photographs portray the detritus of American consumption. Gaining access to some of the country's largest industrial waste facilities, Jordan photographs the refuse of consumer culture (e.g., diodes, cell phone chargers, cigarette butts, circuit boards) on an immense scale. Spanning up to ten feet wide, Jordan's prints are at once abstract and detailed. The frequent use of distorted perspective, repeating forms, and disorienting scale help create the illusion of abstract landscapes. 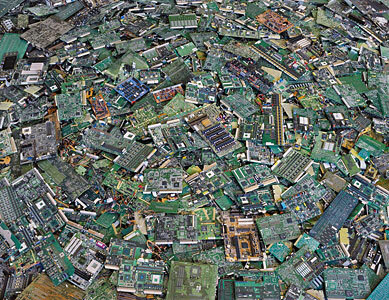 A pile of sawdust appears to be a massive mountain; an endless expanse of circuit boards looks like an aerial view of a dark city. In some instances, Jordan has located specific discarded objects at waste facilities and photographed them on location. In other instances, the artist has created elaborate sets, which are then photographed in his studio. Some images are constructed from multiple 8x10-inch negatives that the artist has digitally interlaced into a single image. Born in San Francisco in 1963, Chris Jordan currently lives and works in Seattle. Prints from this body of work have been exhibited at the Center for Fine Art Photography in Fort Collins, Colorado; the Tacoma Art Museum in Washington; and the Foto&Photo Festival in Cesano Maderno, Italy. A catalog of Jordan's work entitled Intolerable Beauty: Portraits of American Mass Consumption was published in 2004.